So the painting in the engine room has started. The first step is to put a couple of coats of primer onto all the patches of bare steel around the place. 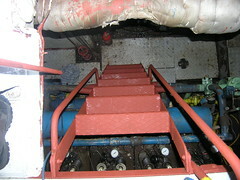 You can see the first of the primer applied to the steps into the engine room. Not that the steps were that rusty or anything, it just seemed like a good place to start. First steps and all that! Plenty more to go yet. With the rain continuing and the engine room clean(er) but wet, attention was switched to rust busting up in the forepeak. It's another grim looking picture, I know. 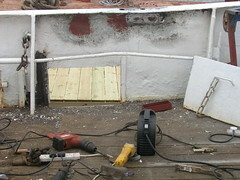 I'm reminded that there is still big a section of plate that needs to be cut out and new steel plate welded back in, as there are holes in the starboard side which have simply been covered over with duck tape for now. This is exactly the same issue as we had on the port side, it's just that this plate was not replaced in the rush to leave Fareham. New plate or not, the rest of the place still needs sorting out. 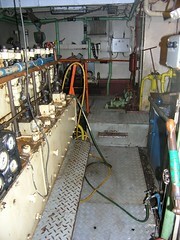 The recent wet weather finally prompted some cleaning down in the engine room. From time to time I've made a start of some sorts, but never made any real inroads. 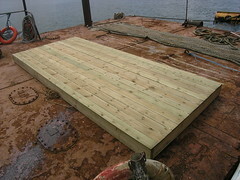 Now, with Fred's help the deck plates and the bottom of the sides have been cleaned. For those of you who have been down in Lady Jane's engine room, you will really appreciate how significant this cleaning effort has been. The next step is primer onto the cleaned up rut patches, making a good surface to paint. So it's been three years that I've had Lady Jane. Three years!!! I can hardly believe it. This last year has gone so fast. I've made good progress getting on top of things in the time I've had her, but there is a long way to go yet. So many people have helped with getting Lady Jane this far, so this is a chance to say a big thank you to everybody who has contributed over the years. You all know who you are. Special thanks go to Patch, Fred and John who have all helped so much in completely different ways. 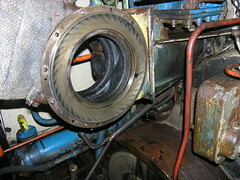 I've been working away at cleaning the last piece of the turbo, which has remained on board. Working away at cleaning this has reminded me that I really need to get going cleaning up and painting in the engine room. A big project in it's own right. A lick of white paint on the walls plus the engine and pipes etc all freshly painted their respective colours will make such a big difference down there. 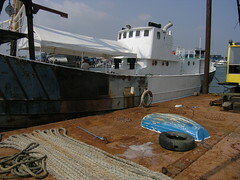 Finally, I've got the last of the welding on the port side done. Well on this section anyway. There is one small seam to be welded that Robin forgot when he welded in the new plate up forwards. The Hilti breaker you can see in the picture is on account of the rust busting I had to do, part of cleaning up the area surrounding the welds prior to re-painting that section on the inside. The eagle eyed observer will also note I had to weld the left hand bracket which holds the sluice gate in. So the new platform has been constructed, with help from Fred. It's a little bigger than I had planned at 2.5m * 4.8m (7.5ft * 14.4ft), as the wood came in 4.8m lengths, but that's not a bad thing. Next I'll need to fill the underside with foam so it floats well, screw in a few cleats, paint up the wood with a protective coating of some sorts and seal the gaps so ultraviolet can't get to the foam below. I'll also think about attaching some kind of protective rubber strip around the edges. Maybe another day or so's worth of work if I'm lucky. It also occurs to me that I could use my platform to move any heavy stuff between the shore and Lady Jane, sort of as a mini barge. It would help save the rib tubes, if nothing else. I'll need some help launching the thing, as it's pretty heavy! I am really missing the platform I was using in Fareham, even though it caused me some problems occasionally. The trouble is the crane barge is quite high out of the water, especially at the front, making it hard to work close to the waterline. In addition, Lady Jane is not so easy to manoeuvre relative to the barge, for reaching further along. Fred suggested I see about getting the platform craned onto the Donald Redford and have them bring it round for me. Unfortunately I don't really see that as an option, besides the platform isn't mine anyway. Inspired by Bowiechick's post, I'm now planning on building myself a floating platform from scratch. 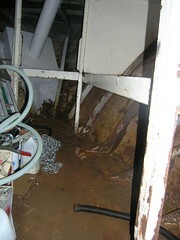 I'm thinking some 4*2 for the frame, some 2*1 for internal struts and deck, and spray foam for buoyancy. In terms of size, I'm thinking 4m by 2m (12ft * 6ft) should do it. I think if I get the buoyancy just right, the platform will be perfect for working almost all the way to Lady Jane's waterline. 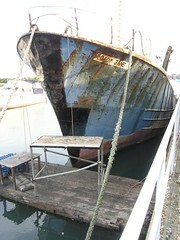 Here is the Sand Weaver, a regular visitor to one of the wharves opposite where Lady Jane is moored. She is a big vessel to manoeuvre so things must be tense on her bridge when she arrives on busy days. At times like these her arrival is often heralded by five blasts on her horn, warning small boats to stay clear. 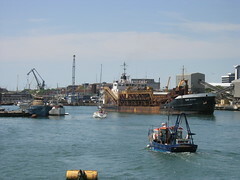 The confusion arises when small boats try to stick to the correct side of the channel, to the starboard side of the river, not realising the Sand Weaver is intending to come alongside there. 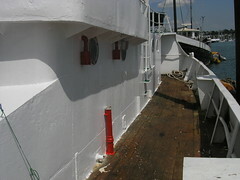 Finally, after all this time, some primer on the port side. With so much white on Lady Jane, all I need is a big red cross and she could pass as a hospital ship. I've still got one last hole to finish welding, but after that it should just be rust busting and painting to finish the port side. It doesn't look that much but, based on my experience, I'm guessing it will take me a good few months to get that port side painted completely blue. Fred has been splashing the white paint about, while Patch has been working on the more delicate task of painting the diesel pipes and vents red. The red denotes diesel. I know it's a small thing, but that second coat of white with the red trim makes me so proud of her. Lady Jane just keeps on getting better and better. I finally got to spend a bit of time heating the hinges on the two seized scuppers to burn off the rust and paint. 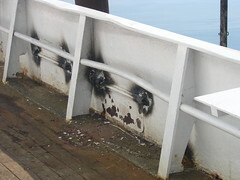 It was quite a pleasure to sit there a while in the warm sunlight, with the oxy-propane torch doing the work for me. The black marks are the evidence of my attentions. Almost magically, the scuppers are now swinging freely. A bit of cleaning up and a lick of paint, after greasing the hinges, will mean the scuppers will be as good as new. 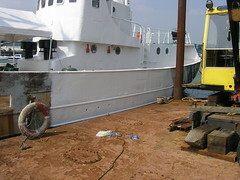 More importantly, now the hot work is done here, work on painting the outside can start on this section. It's not that often I get exactly what I ask for, and very rarely now do I get it virtually immediately. With Lady Jane I've become used to a certain amount of teeth sucking and 'well now's when seeking parts or assistance. Before leaving Fareham, and while investigating faulty gauges on Lady Jane, Robin discovered the turbo pressure gauge was not faulty, but that the turbo was not producing any pressure. Apparently the turbo pressure should be around about two bar (30 psi) or so. Anyway, with the stuck air start valve, I noticed exhaust gas seeping back through the air start system. My thinking was that if the turbo was working properly, this should not happen. So determined to start doing something about it. My turbo is made by Brown Boveri & Co.
As ever, my first port of call was the Internet, and it turns out that Brown Boveri are now called ABB, a huge Swiss engineering company. On their web site I found the turbo section, and filled in the web form by way of contacting them. I thought to myself "I'll have to prod them in a week or so to get some kind of response". 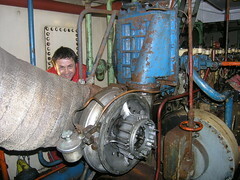 To my amazement, George, from ABB, phoned me that day and, unbelievably, arranged for an engineer to come out to the boat to see the turbo before the end of the week. The fact that their workshop happens to be a stone's throw from where Lady Jane is moored was an advantage I'm sure. Now to my mind, someone coming out to look at the turbo would be just that, looking. Not so, Trevor arrived with his toolbox and overalls, and got stuck right in pulling bits off, with hardly even time for a cup of tea. Not what I was expecting at all. It turns out that ABB sell spares for my turbo, and in fact you can still buy new ones exactly like mine if you were of a mind to. I was genuinely expecting it to take easily a month to get to this stage. Of course, there is money involved, and I'm finding myself spending on the turbo long before I had expected to shell out anything on it, but to my thinking it's started now so I may as well see it through. What I find absolutely fascinating is just how intricate the internals of the turbo are, the main shaft looks akin to a jet engine (it spins at 28,000 rpm or so). Things were moving pretty quickly and I forgot to take pictures. Currently most of my turbo is now at ABB's workshop being cleaned and balanced. I've also taken off the exhaust side of the turbo, after a bit of a struggle, and that will also go in to the workshop for a proper cleaning. The rest of the turbo I'll clean in-situ, as it seems too much work to take it off for the perceived benefit of cleaning just that bit. The next trick will be to get the whole lot back in and assembled. So far so good though.